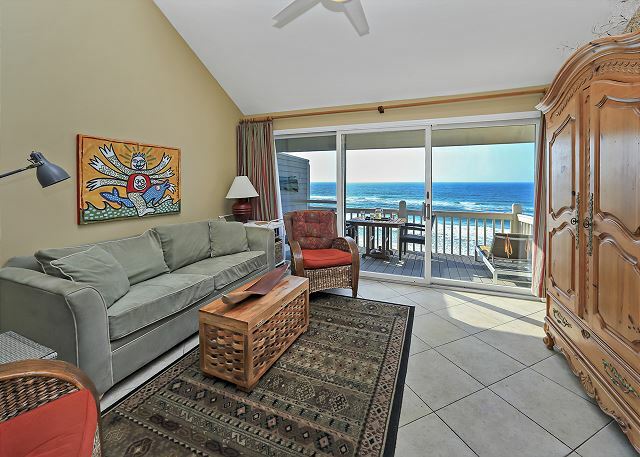 The sparkling blue green water of the Gulf of Mexico beckons from the moment you open the front door of this charming beach-front condo because that is literally the first thing you see! Now, that’s what you call a VIEW!! Follow your instincts! 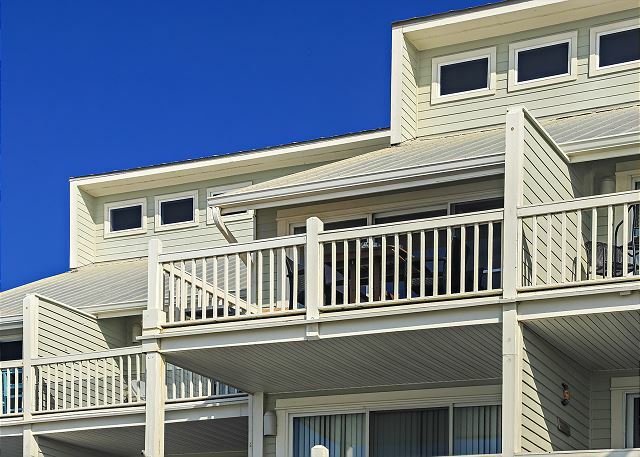 Head straightaway to the balcony! 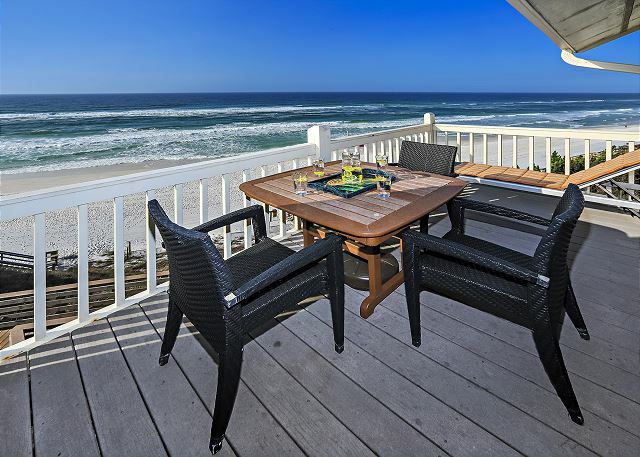 Take a seat at the table for four, and as the sun sets and the moon rises, make a toast and enjoy a meal or relax on the recliner with a cocktail. The 24 unit Mistral complex is built on a high cliff and #22 is on the top floor. 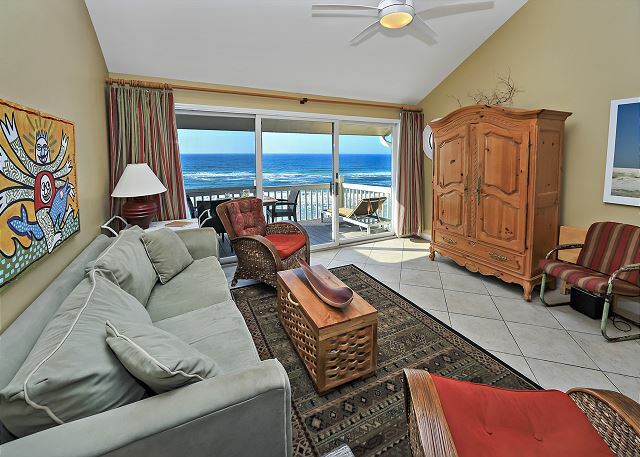 From the balcony you enjoy an unobstructed view the Gulf from Panama City beach to the left and Destin to the right. 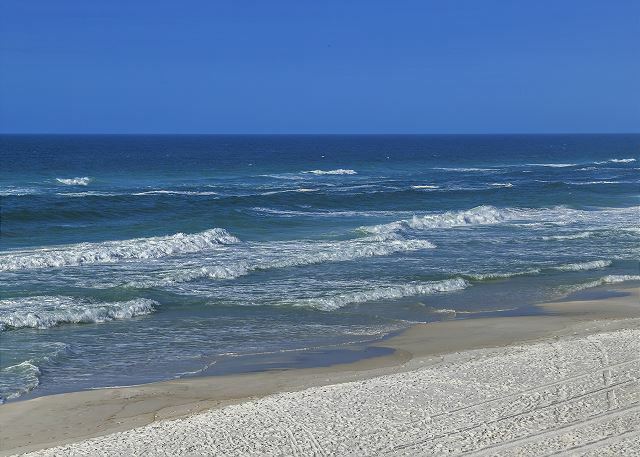 Go ahead….enjoy the phenomenal VIEW! 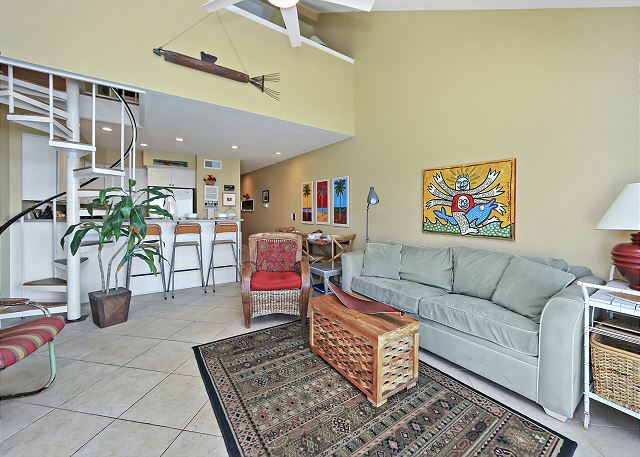 Mistral 22’s decor is stylish and comfortable, with numerous original artworks and family photos. 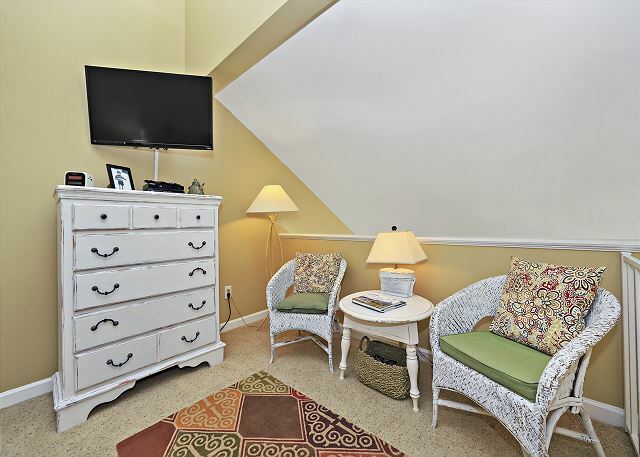 In the living room there’s a large sleeper sofa, a large chest which doubles as a coffee table and contains extra linens, three charming rustic arm chairs, and a 42” smart TV and home theatre system housed in an elegant pine armoire. 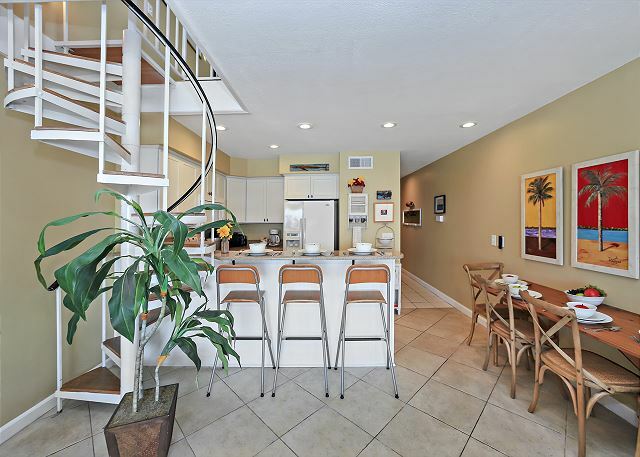 The living room feels spacious, with vaulted ceiling and open connection to the updated, and well-lit kitchen. 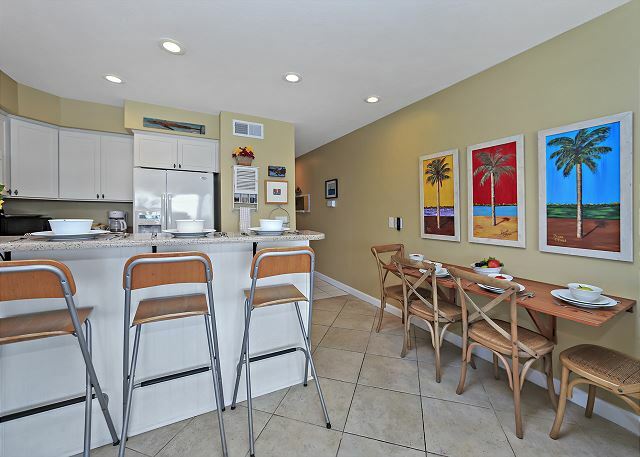 The kitchen has everything you could want, including Silestone countertops and a raised bar with 3 stools, a glass top stove, an overhead microwave, roomy side by side fridge with water dispenser, quiet dishwasher, toaster oven, coffee maker and more. Two fold-down tables in the dining area between the kitchen and living room provide seating for four. And no matter where you are in either room you simply can’t miss the VIEW! 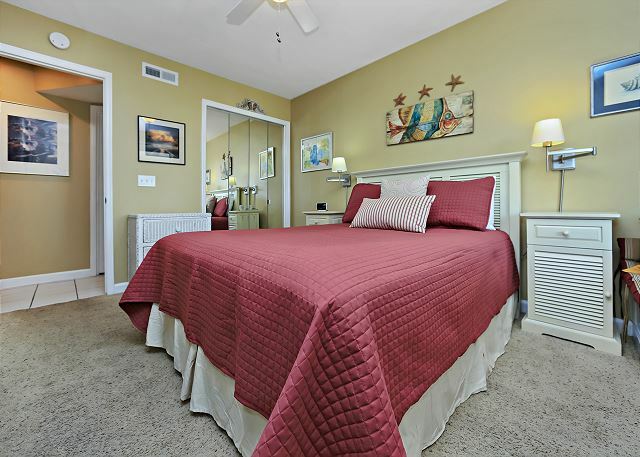 The downstairs bedroom features a white queen-sized bed flanked by wall mount adjustable reading lamps, side tables, wicker chest of drawers, small console table, ceiling fan, glass front closet (with beach toys and chairs), 42” smart TV, Sony blu ray player, and cushioned window seat. 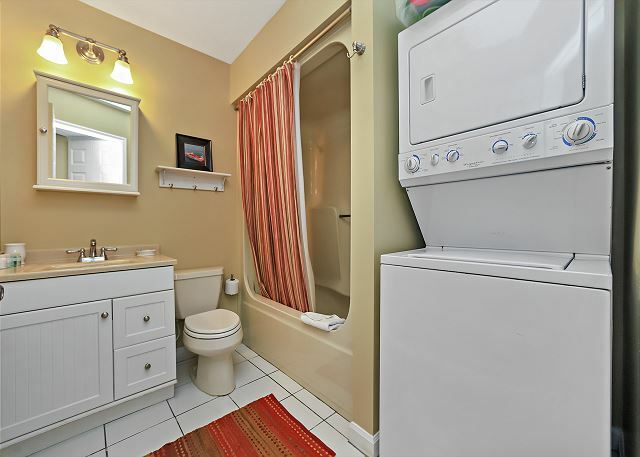 Just across the hall is a bathroom with tub and shower combination, a single vanity with Silestone countertop, a medicine cabinet, and a stacked washer and dryer. 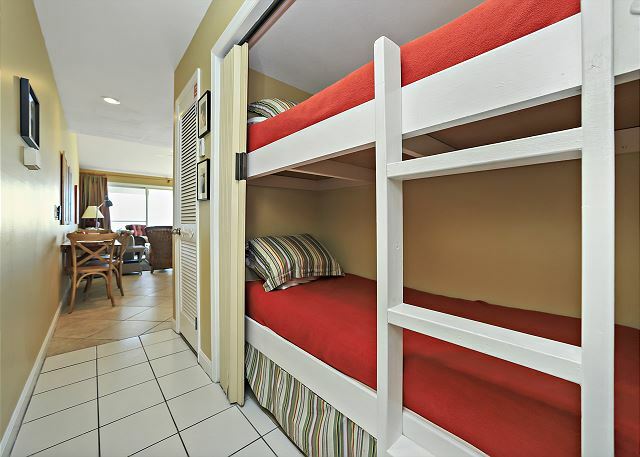 Kids will adore the comfortable bunk beds in the entry hallway just around the corner from the bathroom. 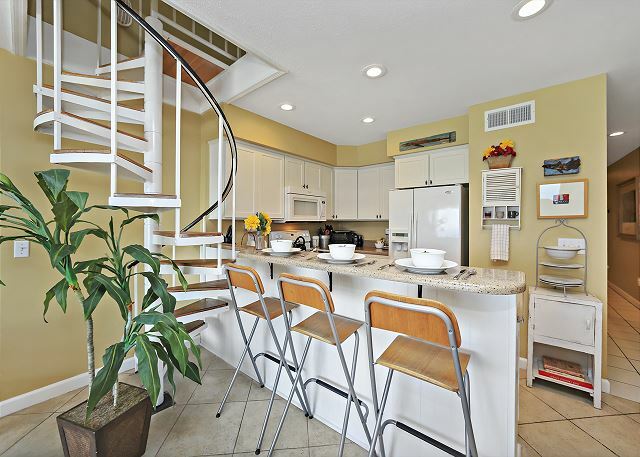 From the living room take the spiral staircase to the large master bedroom loft which overlooks the living room. 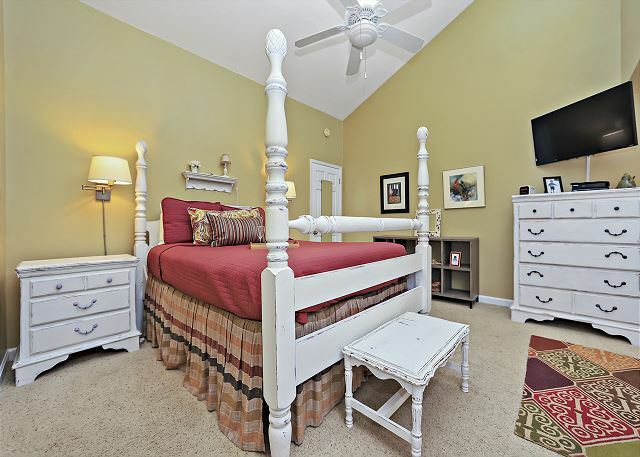 The elegant white queen-sized 4 poster bed is the centerpiece of the room, but there are also two charming nightstands, wall hung adjustable reading lamps, a handsome bookcase, a large chest of drawers, a ceiling fan with light, and a 38” smart TV and Samsung blu ray DVD player. 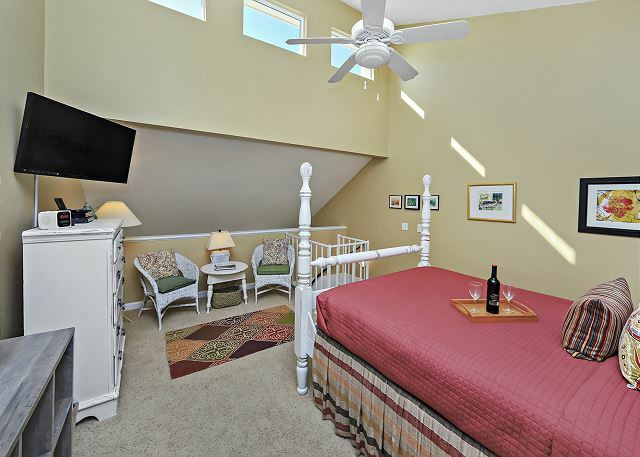 There’s also a comfortable reading area with a rug, two lamps, and two cushioned wicker chairs. The newly renovated master bath is truly a show stopper. 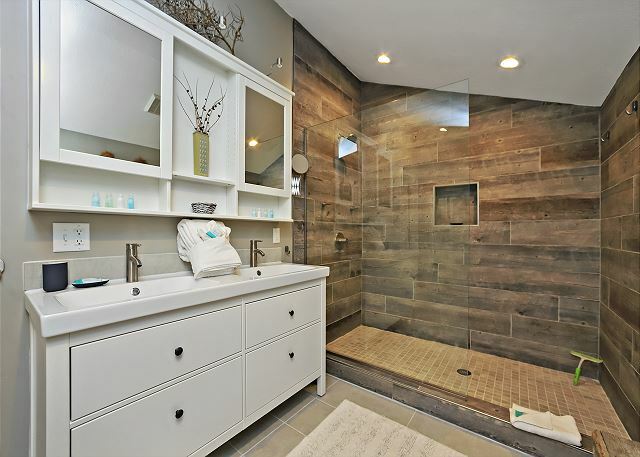 The strikingly beautiful large walk in, glass shower with its driftwood-like ceramic tile combines with the room’s taupes, white and off-white colors that take your breath away and make you feel comfortably relaxed. The shower features a rain shower head, a recessed nook, and hooks for towels and wash cloths. The white double vanity with 4 large drawers and matching mirrored medicine cabinet make this spacious bathroom easy for two guests. There are plenty of hooks from which to hang additional towels, jewelry, and clothing. A full-length mirror, magnifying makeup mirror, and hair dryer are provided as well. 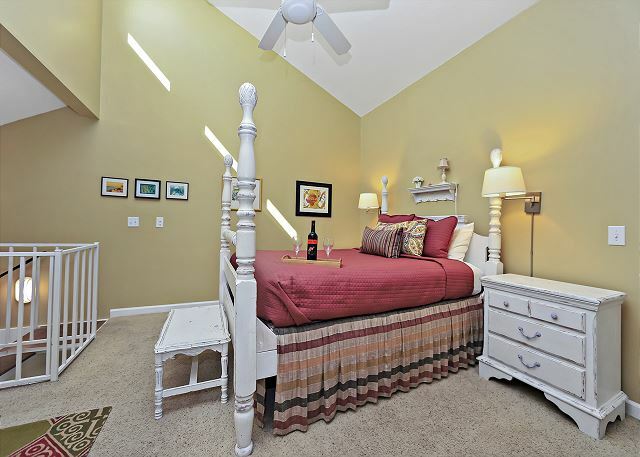 The closet provides hooks, hanging space and shelves with extra blankets and pillows, and also includes an iron and ironing board. 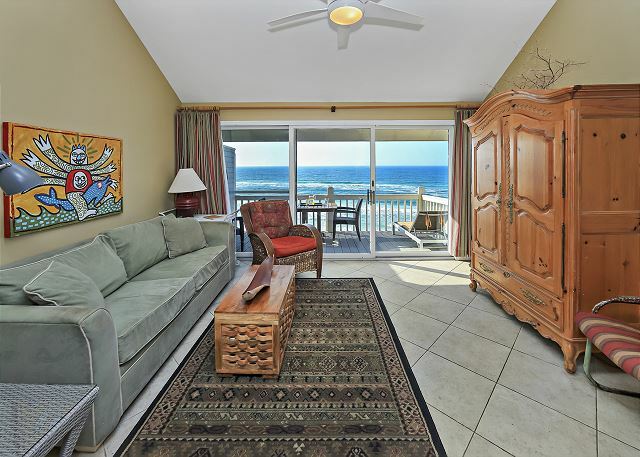 Mistral 22 sleeps 8, making it the perfect destination for a large family or two couples with or without kids. 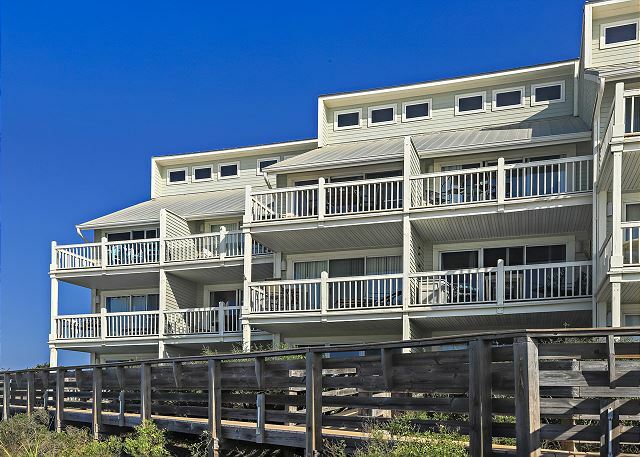 It’s conveniently located on the eastern end of 30A between Water Sound and Alys Beach, near two Publix stores, and everything on or around 30A. 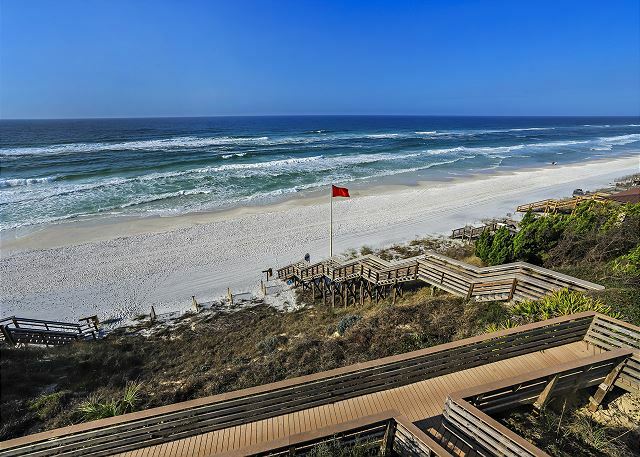 To get to the beach, simply follow the walkway to the private beach access. For your convenience, there are showers and hoses located at the platform at the top of the steps to the beach. 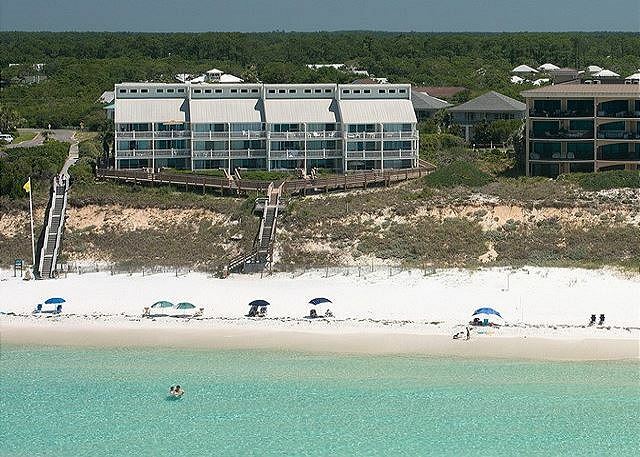 Also, the pedestrian/bike trail, which runs the entire 18 mile length of 30A, is conveniently located right in front of Mistral. Enjoy!